Richard Prenkert has been playing the guitar now for 40 years and still performs locally. He has a Bachelor of Arts degree in Music from Sonoma State University in California. He has studied with George Sakellarion, Philip Rosheger and Richard Stover. Richard is currently on the faculty staff at Santa Rosa Junior College and teaches several guitar classes in the music department. 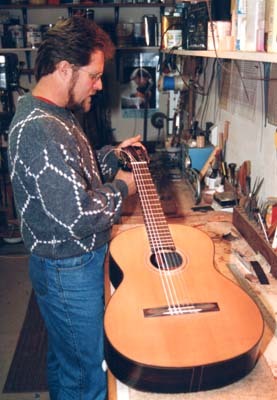 Richard began his career as a Luthier in 1979 when he co-owned a music store in Santa Rosa, California. He has exhibited guitars across the United States, Canada, South America and Europe. Displaying his instruments at local woodworking shows, he has earned the Excellence in Woodworking award from the Sonoma County Woodworkers Association. Richard’s shop is located near Sebastopol, California and he currently produces 15-20 instruments per year. Players of the Prenkert guitar include Carlos Barbosa-Lima, David Grimes, and Richard Stover.